The 15 and 13 inch Retina Macbook Pros are (likely) receiving an update on October 15th, and tons of people have asked me “Will the Retina Macbook Pro have…?”. Based on these requests, and the quantity of misinformation out there, I’m releasing a guide as to what to expect for the retina macbook pro, which should be confirmed on the release date, of October 15th. If you’re interested, also check out our popular guide to Apple rumors 2013. What Processor will the new Retina macbook Pros have? Expect the next Retina Macbook Pro updates to have intel’s latest Haswell quad core i7 processors, which are faster and more energy-efficient, contributing to longer battery life. Haswell is practically a given, and here’s why: Apple’s lesser line of laptops, the macbook airs, got Haswell at Apple’s WWDC in June. Apple’s iMac line of computers were upgraded to Haswell i5s and i7s just last week. Beyond needing to upgrade their pro line above that of their consumer line, Apple also needs to match competitors who are already sporting Haswells. Haswell is not an option. How Much RAM will be available on the new Retina Macbook Pro? The new Retinas will likely offer 16 GB of RAM as stock (8 for the 13), with a possible (though unlikely) option of a 32 GB upgrade. Given the prevalence of gaming, and the typical advancement that comes with an upgrade, I find it unlikely that Apple wouldn’t give 13 inch users an opportunity to upgrade to 16 gigabytes (already stock on the 15 inch), but Apple definitely could ground 13 inch users at 8 GB total. More than adequate though. 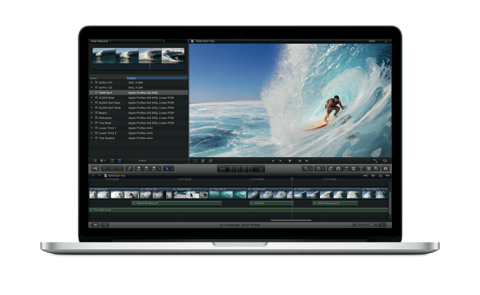 Will the Retina Macbook Pro offer a 1 TB SSD (solid state drive)? I’d put this in the category of “likely”. Users want more storage: It’s a fact. On the 15 inch, I’m predicting that the upgraded SSD option will be shifted up from the 768 gigabyte SSD, to a 1 terabyte SSD. On the 13 inch, Apple will probably continue to limit users to a 768 gigabyte drive. It’s about time Apple offers a 1 TB solid state laptop. Will the Macbook Pro design change? Probably not much. Apple may add another USB port (just an example of something they could do, not a prediction), or they may add a higher resolution Facetime camera, or improved speakers, but odds are the classic, thin, aluminum design, with the black bezel will remain largely the same. Will Apple Update the Retina Display? No. Apple will probably update the graphics processor, and build in more memory, but the flagship Retina display will not change. It already leads the industry, so there’s no reason to develop a new display, and they’re not releasing a touch screen mac anytime soon. Will Apple Update the Cinema/Thunderbolt Display? This question is anybody’s guess. The thunderbolt display is long overdue for an update, and could use a retina display, but that whole line of displays is highly unpredictable. Will the new Retina Macbook Pros have better battery life? Yes. The Macbook Pros will likely have a much longer battery life, though the battery may not be much larger. Haswell processors (see above) are far more energy efficient, which should add at least a half hour to an hour. The new OSX Mavericks operating system is also remarkably efficient, and should add several hours to battery life for web browsing. Read all about Mavericks here. Post by The App Store Chronicle.